What went wrong at Kraft Heinz Co.? Years before last month's jaw-dropping $15.4 billion writedown, the company had been on a mission to make over some of its quintessential products, removing maligned ingredients from its mac and cheese and hot dogs to better compete with newer, more natural upstarts. The reformulations weren't enough. A month after the startling acknowledgement, the shares still haven't recovered, a sign of how difficult the road is ahead for Kraft Heinz and its Big Food rivals. While some of the packaged-food giant's brands are still growing-the company in an email pointed to Heinz, Philadelphia cream cheese and Lunchables-many iconic brands are losing market share. The days of loyalty to the big-name labels are waning. - Too processed: Consumers want healthier, more values-driven products and flavors that reflect the wider world. At Kraft Heinz, healthier has largely meant giving a face lift to old favorites. In March 2016, it replaced artificial dyes in its macaroni and cheese with ingredients like paprika and turmeric. It was an implicit recognition of the clean labels movement-and the growing competition from Annie's, a once niche natural and organic mac and cheese maker acquired by General Mills for about $820 million two years earlier. Then, Oscar Mayer in 2017 removed all added nitrates and nitrites from its entire line of hot dogs, as well as artificial preservatives. That move came two years after the World Health Organization said there was "sufficient evidence" that eating processed meat causes colorectal cancer, and after Hormel closed a $775 million acquisition of natural hot dog maker Applegate Farms. "Stepwise reformulation is positive for those people who keep on eating products as they always have," says Margo Wootan, vice president for nutrition at the Center for Science in the Public Interest, a consumer health advocacy group. But for both products, tweaking around the edges isn't enough. "There's just a growing number of consumers that no matter what you do, they're never going to buy it." Even when trends could work in a brand's favor, Kraft Heinz proves that it's not that simple. High protein diets and the rise of snacking should be a shoo-in for its nut brand Planters, but sales dropped 21 percent last year from 2015 levels, according to data from Euromonitor. 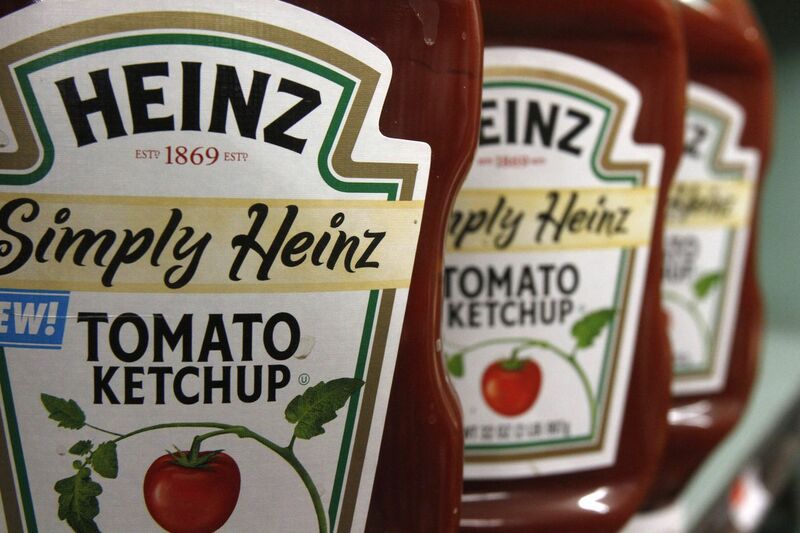 - Competition: Ketchup isn't going away, and Heinz continues to be the dominant, and growing, brand in the category. But the condiments aisle is no longer limited to ketchup, mustard and mayonnaise, and even those standard bearers are now offered in no-added-sugar, no-added-salt and organic varieties-from Heinz itself and an onslaught of rivals. There's also chili sauce, ranch dressing, aquafaba (made from chickpea liquid), Sriracha, avocado spread-it's a growing list with no end in sight. "The world of completely homogeneous, ubiquitous products is more and more coming to an end as the world continues to fragment," says Scott Norton, cofounder of Sir Kensington's, a condiment company that launched its natural ketchup in 2010 and was acquired by Unilever in 2017. "We are not one America, we are many Americas, and what we eat and what we buy needs to represent our diversity." In coffee, too, consumers' options are expanding. Millennials, looking not for the best price but for the best story, are exploring a world beyond Peet's and Starbucks, trading up to brands like Equator, Blue Bottle and Intelligentsia. At the same time, value shoppers can buy Cafe Bustelo, McCafe or Dunkin'. Mergers and acquisitions, including Nestle's majority stake in Blue Bottle, and Peet's purchase of Stumptown and majority stake in Intelligentsia, as well as e-commerce, have meant geography is no longer a limiting factor to finding the right brew. While Maxwell House launched Max Boost, a higher caffeine line focused on younger consumers, that demographic is turning to more artisanal roasters. "There's a generational stratification between older generations who have been drinking the Maxwell Houses for a lifetime and the millennial generation that grew up in the Third Wave of coffee and would never drink Maxwell House," says Ted Stachura, director of coffee at Equator. He referred to the popularity of smaller-batched, carefully sourced and produced coffee that builds on the Starbucks-driven Second Wave. "They know what they like and know the brands they want to associate themselves with." Competition comes not just from other packaged-goods companies, but also from private labels, an increasingly formidable force in supermarkets. The products are no longer just price plays, as retailers have also found an opportunity with organic and natural products. In 2018, brick-and-mortar private-label sales grew 4.6 percent, compared with 1.1 percent growth for branded products, according to Nielsen. "Retailers have been able to gain trust without traditional advertising," says Carrie Mesing, vice president of merchandising at FreshDirect. The company has private label 100 percent grass-fed organic hot dogs and blended, single-origin and organic coffees, too, with more than a hundred more items in the pipeline and double-digit year-over-year growth in most categories. "We're directly connected with our consumer." - Made for kids: For Big Food, parents are proving to be a force to be reckoned with, whether its activists testing orange juice for the herbicide glyphosate or Michelle Obama pushing Darden Restaurants, the owner of Olive Garden, to change its kids menu. Even as nutritionists debate how much meat and cheese should be in any person's diet, one particular ingredient continues to be on the receiving end of near-universal scorn: sugar. Kraft Heinz's Jell-O and Kool-Aid are both products with lots of sugar, no nutrition and made for kids, marks for a parent paring down a shopping list. Sales of Jell-O have dropped 26 percent from 2013 to 2018, according to Euromonitor data, outpacing the dessert mix category as a whole, which lost 22 percent. But some of the company's other kid-targeted products are standing their ground. Kraft Heinz said in an email that its single-serve kids beverage business grew 1 percent in 2018, following multiple years of decline, lifted by items including all-natural Capri Sun and Kool-Aid zero sugar. Lunchables, which now include options like Organic Extra Cheesy Pizza, is still resonating with consumers. The brand climbed 27 percent in the six years through 2018, according to data provided by the company. Selling junk food to kids, though, is a fraught business, and while Kraft Heinz agreed to limit its marketing to children in 2006 and updated those obligations in 2013, the brands still target them. Case in point: Jell-O's edible slime, launched last year. - Going forward: Despite its reputation as a pure cost cutter, Kraft Heinz has put some resources into new brands, launching Oprah's O, That's Good-a frozen soup, sides and cauliflower-crusted pizza line-and acquiring Primal Kitchen, which makes Paleo-friendly condiments. Both seem more aligned with consumer expectations, says Tim Barder, principal at consulting firm Arthur D. Little. "If consumers perceive something as healthy or natural, even though it may not be, they tend to flock to those products," he said. Still, Kraft Heinz needs more than Oprah's blessing. "One particular launch isn't going to move the needle," says Erin Lash, an analyst at Morningstar. Investment into research and development and marketing is needed across the board, she says. "Marketing is an important aspect that you shouldn't try to save on," says Artur Bryzghalov, an analyst at Brand Finance, a brand valuation consulting firm. "Even though they might change the ingredients, not everyone might be aware of this."